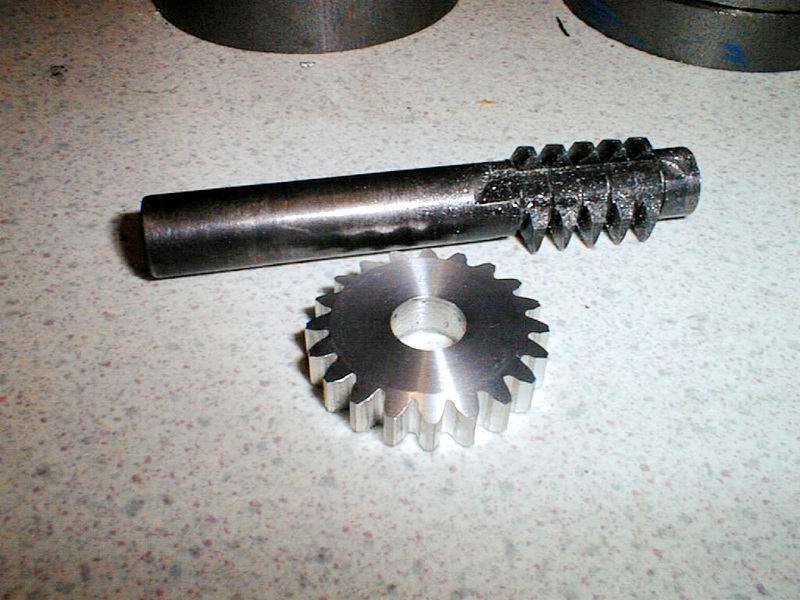 The mini mill digested its gearbox recently, so I'm attempting to cut some new gears for it out of metal. This is a bit of a learning curve for me, so I'm taking my time. 06-Dec-2002: The motor gears are metric module 1.5 as shown of the far left, the larger gears inside the gearbox don't seem to fit any known pitch. They are too big for metric module 2.0, and are slightly bigger than 12 DP. If I make all the replacements Module 1.5 then I only need one hob. 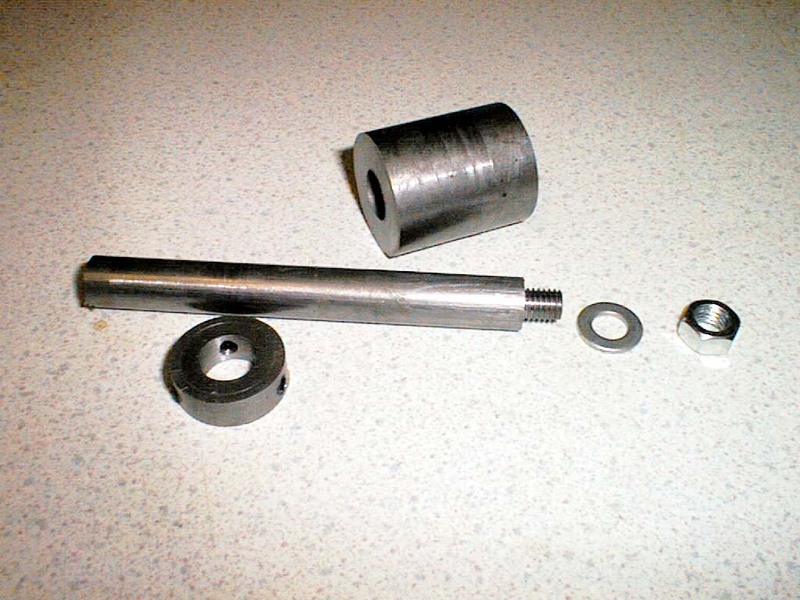 26-Dec-2002: I've started making a metric module 1.5 hob from some 3/4" Silver Steel (drill rod) which will later be hardened and tempered. 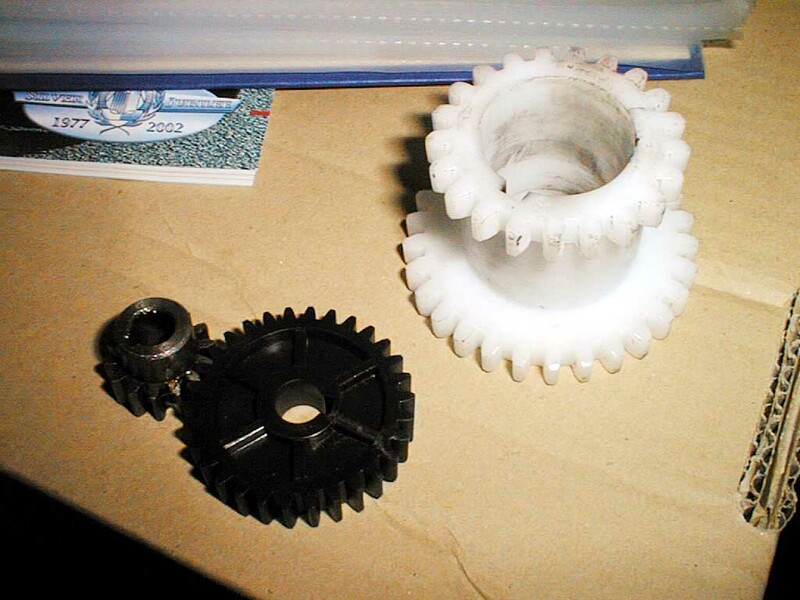 Shown below is the Module 1.5 motor pinion from the mini mill for reference, and the 40 degree cutting tool used to turn the hob. To avoid chatter, the whole thing was machined at 60 RPM and regularly sprayed with "suds". 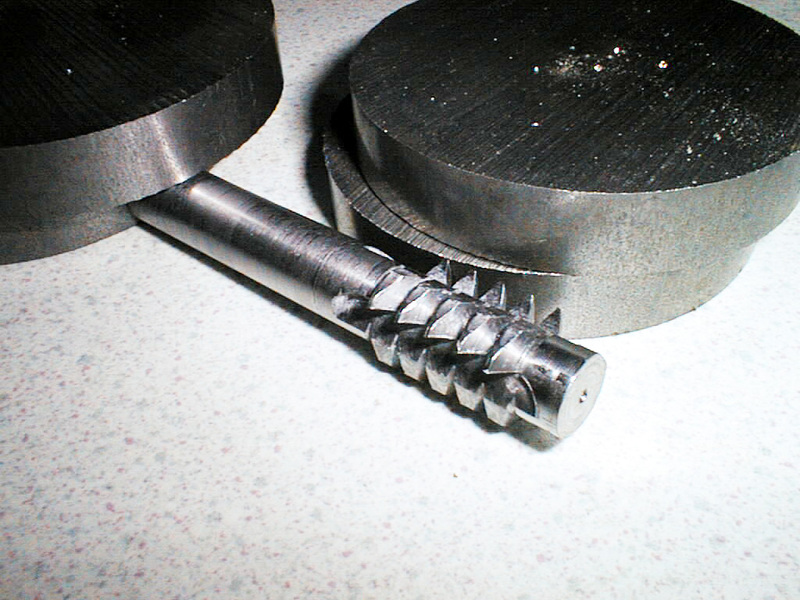 It took around 6 hours to turn this little fellow, and the HSS tool snapped twice. 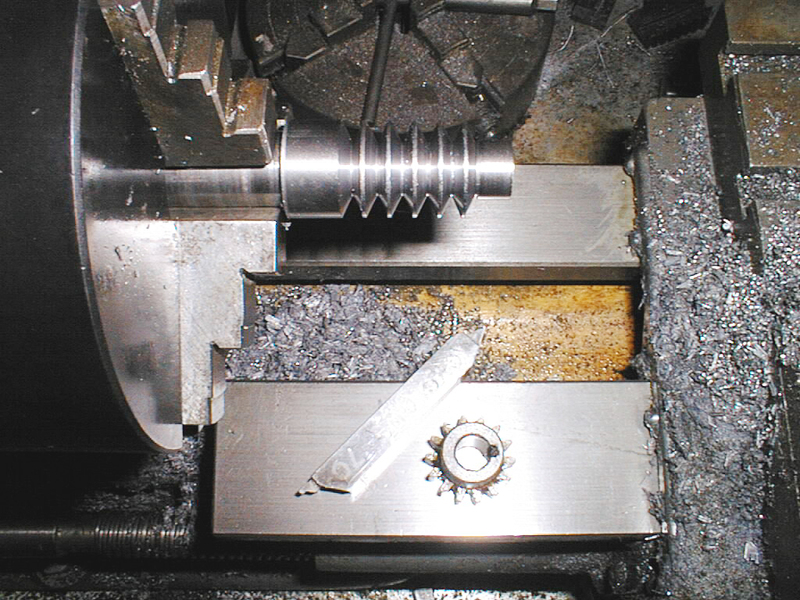 5-Mar-2003: It's been a while since any developments, but the hob has now been milled to relieve the teeth using the new rotary table bracket. There are three rows of teeth, it would probably have been better with 5 or 6. Pictured behind are some mild steel gear blanks. Next step for the hob is heat treatment to harden the silver steel. 7-Mar-2003: All done, the hob works fine - shown is a 20 tooth metric module 1.5 gear cut with the hob. The sketch above shows the dimensions as best I can work them out for a metric module 1.5 rack. The rack form will be used to cut the gear. Not wishing to spend a couple of evenings turning up another expensive lump of silver steel, the new hob is going to be made from mild steel and then case hardened - for the amount of use it will get, this will be fine. It will also be removable from the shaft which in this case is 1/2" diameter. The reason for the imperial size is that any hobs I make up from now on will fit a Jacobs type gear hobber. A collar with three M5 grub screws, and an M8 nut/washer allow for axial retention although the 1 1/4" hob blank needs to be broached in some way so that it won't spin round on the shaft. 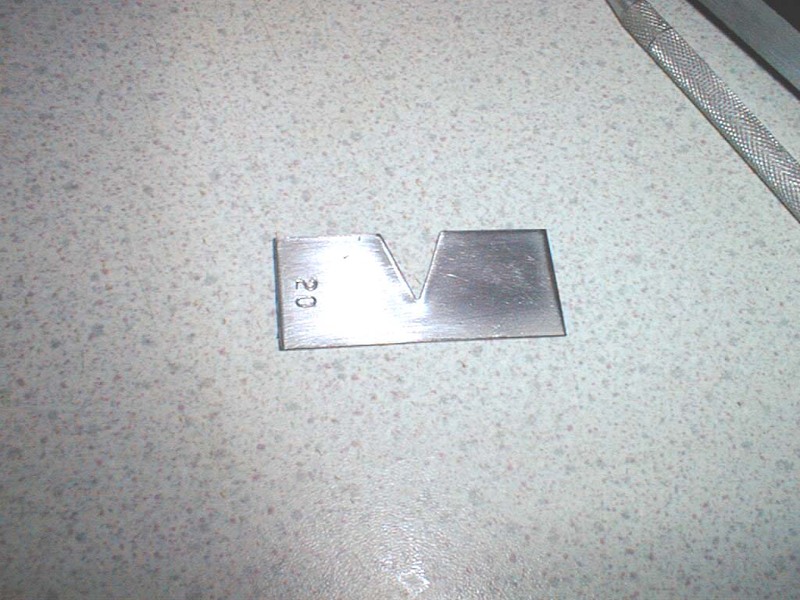 10-Apr-2003: To get the hob cutting tool correct, a setting gauge is required which has been marked out to get the correct 20 degree pressure angle (40 degree point). The material used is 0.7mm steel plate, part of one of those "knock out" panels that cover the drive bays of new personal computer cases. 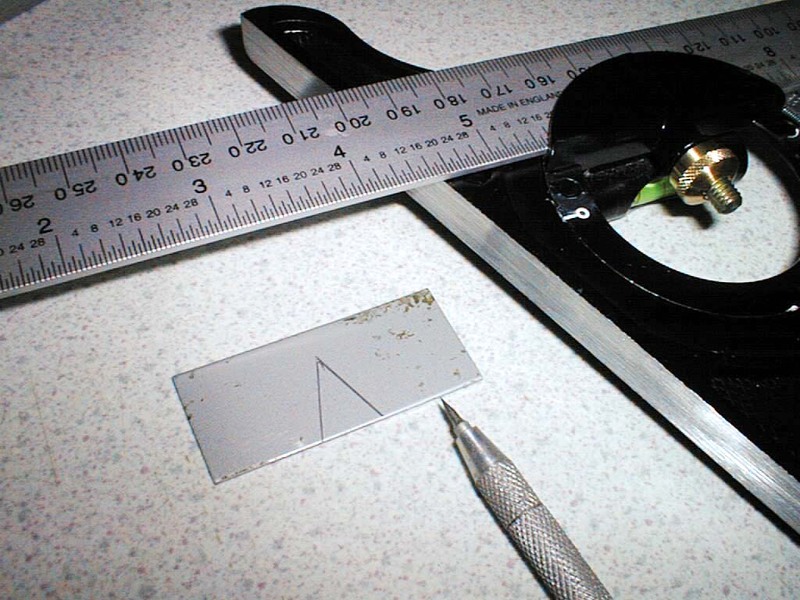 The waste has been snipped just short of the scribed lines, and a needle file used to clean up the remainder. The snipping and subsequent hammer flattening has caused a small amount of distortion.